This DIY beach bag is easy to make and will make a splash at the beach. Beach season. What could be better than a day at the ocean, right? If you’re a mom of small children this may not sound like the relaxing getaway that you envisioned. When my kids were young, going to the beach was more of a chore than a fun time. We had SO.MUCH.GEAR and the kids were too little to help carry any of it. Now that they are older, those days of stressful beach days are behind us and we have limited gear that we bring. One beach staple though is the beach bag and after years of having generic bags, I decided to make my own DIY beach bag that reflected a little more “me”. Today I’m going to show you how to make your own DIY beach bag so even if you’re still at the exhausted mom stage where you are chasing your small kids up and down the beach, at least you have something fashionable to carry all your stuff in. 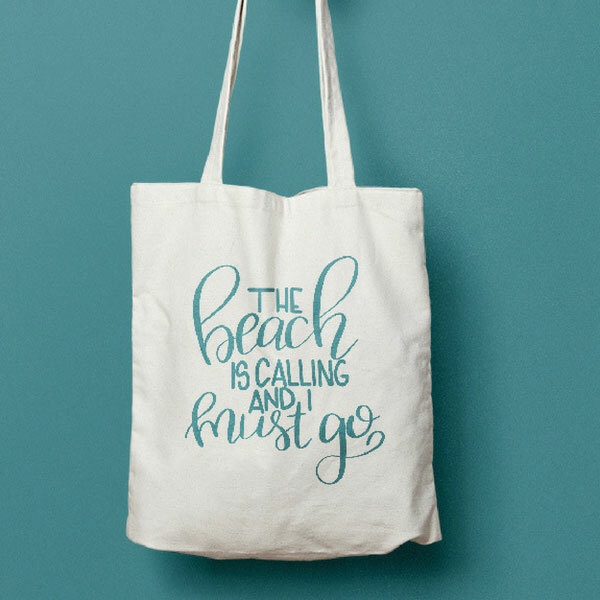 Because the best beach bags are always the cute beach bags. It’s the little things, right? 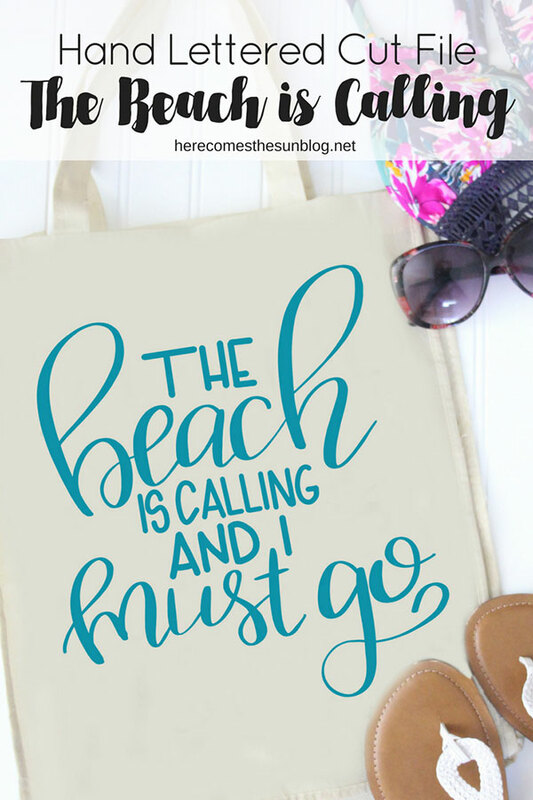 SVG cut file – “The Beach is Calling and I Must Go”. You can access it in the resource library, below. Mirror the image and cut it out on heat transfer vinyl. If you don’t know how to use heat transfer vinyl, this post will show you how. Once your design has been cut out, weed the excess vinyl from your design so you are left with your design on the carrier sheet. Center the design on your bag and adhere it using an iron or Cricut Easy Press. Refer to the instructions that come with your vinyl for temperature settings. If using an iron, you’ll want to make sure that it is on the “no steam” setting. Remember to place a protective layer such as a white cloth or pillow case over the design before you iron. Slowly peel up the carrier sheet making sure that the design has fully adhered to the beach bag. If the vinyl is not adhered, place the carrier sheet back down and repeat Step 4. After you peel the carrier sheet off, turn the bag inside out and iron on the backside of the design. This just ensures that the vinyl is fully adhered to the bag. So what do you think of your new cute DIY beach bag? I’m in love and ready to hit the beach. What I love about cut files and heat transfer vinyl is that there are so many possibilities for these personalized beach bags. You can choose cute beach bags in any color of the rainbow and then coordinate the vinyl color to go with it.